The Small Sale Fisher Forum meeting was conducted at NAFSO on 07th of October 2018. The Indian team Miss. 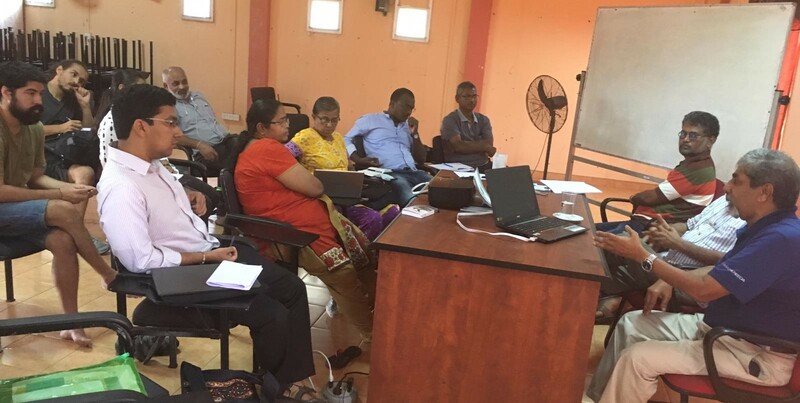 Sri Dar, Kandimathi, Mr.Jesurathnam, Mr.John and Mr.Rajendran and Mr.Herman Kumara, Mr.Nalaka Rosairo, Ms.Deepa Subashine, Mr.Nuwan Pradeep, Canada Team participated in the meeting. University lectures Prof.Oscar Amarasinghe, University of Ruhuna, Dr.G.M.Kularathne, University of Kelaniya and Prof.Upali Amarasingha University of Kelaniya facilitated the discussion. The areas of issues of fisheries industry, usage of aquaculture, situation of Lagoons in country were concerned in the discussion.